They call him “Big Shot Moot.” After a frantic comeback in the PS4 finals of the Road to the All-Star Game tournament last year had Throwdown trailing by three against Top Notch with just seconds on the clock, an improvised in-bound play led to a green release, open corner three-pointer from Mitchell “Mootyy” Franklin that fell just as the buzzer sounded to send the game to overtime. Throwdown dominated the extra session to book their trip to the finals against Xbox One champion Still Trill for the chance to win $250K. Once the ball hit the bottom of the net, the legend of “Big Shot Moot” was born, and Mootyy hopes to be just as clutch in the NBA 2K League come May. 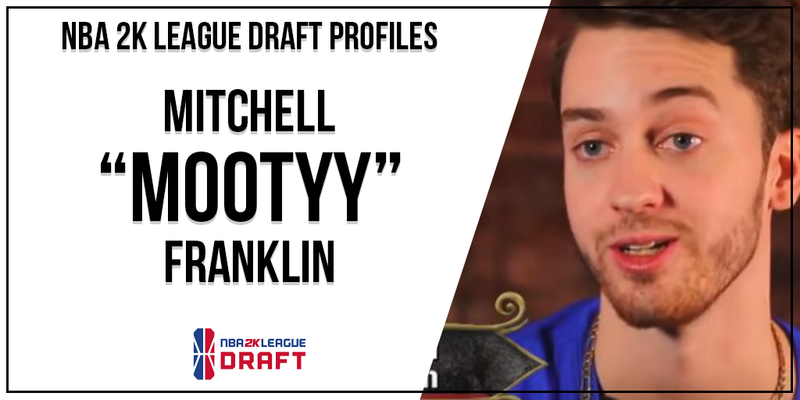 As one of the Pro-Am community’s biggest personalities, Mootyy was invited to the NBA 2K League draft at Madison Square Garden in New York on April 4. DIMER caught up with Mootyy to ask him a few questions about his future in the NBA 2K League. Where were you when you got the call that you made the league? What were you thinking and feeling as you answered the phone and realized that it was the NBA 2K League telling you that you had made it in? I was actually about to walk out of my house to head to the gym when I received the call from the league. I was honestly four to five steps from being out the door when I heard my phone ring. I hadn’t had any other calls that day, so I was reaching into my pocket thinking it was just one of my friends and I was going to be let down. When I didn’t recognize the number, I immediately picked it up. The minute I heard the caller asking if it was me, I almost had a heart attack. I put the phone on speaker so that my Mom could hear it as well and we both started yelling in excitement. I almost broke into tears as the shock set in as I honestly couldn’t believe this was really happening. I actually still went to the gym following the call to calm my nerves and get ready for the next stage in my professional gaming career. The periscope with my immediate reaction is available here. What kind of emotions are you anticipating when you hear your name called on draft night? It will be a surreal experience to turn my dream of playing NBA 2K professionally into a reality. Being able to be drafted at the iconic MSG in New York is a dream come true, so I’m sure I will be filled with emotions when I hear my name called on draft night. Who are some other players who made the draft pool that you would want to team up with in the NBA 2K League, and why? I don’t have any personal preferences for who I play with; however, it would be great to potentially play with my former Throwdown teammate, iiNsaniTTty. Ultimately, I just want to play with a good bunch of guys who want to win and have a good work ethic and personality. You have experience on the big stage after playing in last year’s RTTASG finals in New Orleans. How do you think that’s going to benefit you in the league? Playing on the big stage during last year’s RTTASG has prepared me for the added pressure and stress that comes with playing in front of a crowd and with money on the line. Being familiar with how to the handle adversity under the bright lights and in front of a live audience will really prepare me for the NBA 2K League games. What are your personal goals for the first season in the league? What are your personal long-term goals in the league and with NBA 2K? In the first season, I would like to make it to the championship game. My long-term goal is to make a positive impact in the community that I get drafted in as well as in my hometown in Virginia. I also hope to expand and build my personal brand to the best of my ability as well as being an integral part of several championship-winning teams. What kind of person and player would a team be getting if they drafted you? A team will be getting a dedicated, team-first player and vocal leader who is willing to sacrifice for the greater good of the team and is also able to step up and shoulder the load when needed. I’m ready to embrace the spotlight and contribute when the game’s on the line and I’m always ready to take the “Big Shot” when needed.